It’s often said that a dish is only as good as its ingredients, and that’s never more true than when you’re making something simple like mac and cheese. 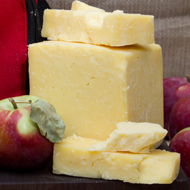 Our newest cheddar, Prairie Breeze, is loaded with flavor, hitting just the right balance of sweet & sharp. It also melts like a dream, which makes it a great choice for cooking. This recipe makes enough to serve a crowd and calls for a hefty helping of cheese – we wouldn’t have it any other way. 1. Heat the oven to 375 degrees. Butter a 3-quart casserole dish; set aside. Place bread pieces in a medium bowl. In a small saucepan over medium heat, melt 2 tablespoons butter. Pour butter into the bowl with bread, and toss. Set the breadcrumbs aside. In a medium saucepan set over medium heat, heat milk. Melt remaining 6 tablespoons butter in a high-sided skillet over medium heat. When butter bubbles, add flour. Cook, stirring constantly, 1 minute. 3. Remove the pan from the heat. Stir in salt, nutmeg, black pepper, cayenne pepper, mustard, 3 cups cheddar, and 1 1/2 cups Gruyere. Set cheese sauce aside. 4. Cook macaroni following manufacturer’s instructions, but cook 2 to 3 fewer minutes than instructions on box, until outside of pasta is cooked and inside is underdone as it will continue to cook in the oven. Transfer the macaroni to colander and rinse under cold water, making sure to drain well to avoid watery mac and cheese! Stir macaroni into the reserved cheese sauce. 5. Pour the mixture into the prepared casserole dish. Sprinkle remaining 1 1/2 cups cheddar and 1/2 cup Gruyere; scatter breadcrumbs over the top. If you like, top with a sprinkle of additional cayenne, black pepper or sweet paprika for an extra kick. Bake until bubbling and browned on top, about 30 minutes. Transfer dish to a wire rack to cool for 5 minutes before serving. Bon Appetit!